Whatever happened to the painterly potter? Watching Alex Shimwell throw on YouTube always reminds me of watching Kevin Millward. Kevin Millward was a visiting tutor during my final year of my Undergraduate degree, he only taught at the university one day a week for four weeks. By this point I had been watching YouTube videos for a year to help with my throwing and I was truly awful. Not only did I not know what I was doing, I didn’t really know what I wanted to do. I had drawings of what I wanted to make which were far beyond my making abilities, so I just tried to make basic forms that were basically cylinders whether that was mugs or platters. At the time I probably couldn’t name more than two or three working potters in the UK, I didn’t really have a clue of professional standards I am afraid to say. I was still more influenced by painters than potters, it isn’t that I wanted to create representational paintings on pottery more that I wanted that quality of mark and colour to fill the pottery with the flowing painterly marks. In fact this could be seen from my first blog which wasn’t titled “Red Fox Pottery” but “The Painterly Potter”. Kevin upon seeing my work questioned me more than any time in my education and I couldn’t really answer anything he asked me. So he took me back to basics, he re-taught me to throw going back to the cylinder, and the bowl. I feel like the five years since I have been trying to learn those basics he showed me then. I feel like I forgotten more than I learnt from those lessons. The one thing he impressed upon my mind was that I need to make positive decisions about what I want from my work and not just be vague about anything whether it is throwing lines, a mark or a shape. As I don’t travel very often, and I don’t really know who I could ask to help teach me, I hungrily look online for that sort of teaching and I can’t find it there either. The thing is I am not sure I am good enough or confident enough maker to produce those high quality resources that I feel we need as a clay community. For years I have seen high quality resources online for painting, there are so many option of live, recorded, or one to one mentoring. Yes most of these options you have to pay for but the cost is very reasonable for someone else’s time, and the resources that are recorded the cost is recouped over a larger amount of users. In one of the interviews I carried out for my masters, one of the makers was very against the idea of the online course. They stated it wasn’t really needed in the UK as we live close enough together, I completely disagree, there are a lot of potters in this country that don’t have space within their workshops to teach anyone else. But it also exposes makers to a worldwide audience rather than just the UK and depending on how you set up the course or resource you could create a much wider access. I live stream which I like and I have been trying Meerkat and Nurph. Meerkat is just me personally streaming from my studio as I make with people are able to watch me as I work and ask questions about the process. Nurph I wanted to try something different which is why I tried the group chat, I didn’t want the focus just on my own making, and I wanted a chance to learn something too. I have more ideas about how to use these new technologies to teach, but ideally I need another person to test them with, as teaching is really about communication, and if you have no one to communicate with it just doesn’t work. So I already decided a while ago that I want more coaching/tuition with my own making, I want to move forward with it and I know I need someone to point out whatever it is I am missing. I would like to try some tuition from someone else online at some point too, but don’t want to ask. As for the painterly potter idea, I don’t know maybe it is something I should explore again. 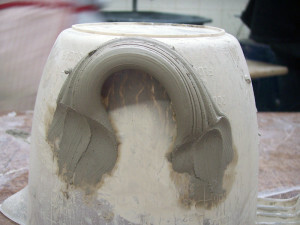 This entry was posted in Learning, Making, Meerkat, Nurph and tagged Alex Shimwell, ceramics, clay, design, journey, Kevin Millward, learning, making, paint, painter, painterly potter, pottery. Bookmark the permalink.